So we have started! 3 days into this and I have discovered a few things. Wed, the first day, was great. A was thrilled! 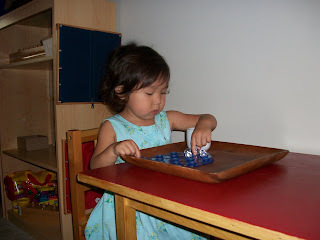 I introduced 4 activities....the first exercise of the knobbed cylinders, a marble placing activity, scooping beans, ad sorting button, and she loved all but one of them. 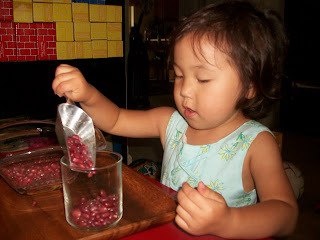 Apparently the sorting buttons is a little to easy for her and she gets really bored. After doing about two of each color it just doesn't keep her attention. Thursday, not so great. I think we started the day and she had two much energy. She could not stay focused on the materials at all and was being very careless and rough. So we stopped, went out for a walk and played hide and seek. I figured we would just table it for the day, but the dad came home and she wanted to show him. 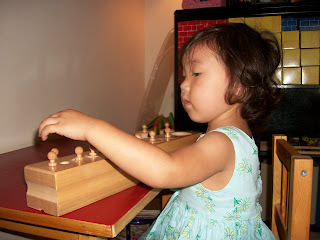 She picked up the knobbed cylinders and carried them to her table but started playing with the cylinders. I took them from her and explained that she has to respect the materials, do the activities correctly and gently, or I will take them away. 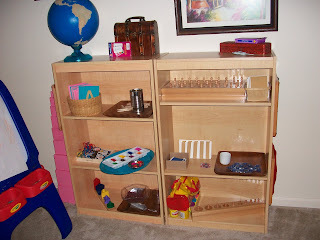 That it is a privilege to do Montessori. If you know my child you know that she goes 90 miles an hour and can be a bull in a china shop. Well the talk worked and we got some good work done at 7:30 at night. Ahh the beauty of homeschooling! Today she was not feeling the best. She has her 2 year old molars coming in and has just been peaked. 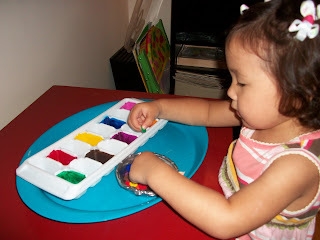 She did the marble activity perfectly in about 20 seconds, so I think I need to add the tweezers to that for her to try. She worked for the knobbed cylinders a bit, and I introduced the sandpaper letters A and B. We'll have to work at this again another day, as she was tired so we finished for the day. I know most people introduce the letters later, but she is ready to start reading an keeps asking to learn to read, so I decided to give it a try. 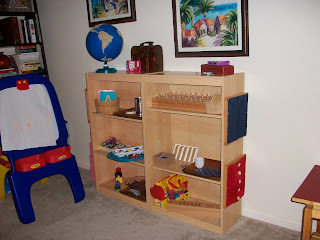 Here are some pics of our Montessori area.